Are a fans of body modification?? have you heard about Corset piercing before?? Corset Piercing this term also called as ladder piercing.. we think this kind of body piercing are really extreme..
Corset piercings, sometimes called ladder piercings, are a series of surface piercings arranged up the back in two vertical columns. The piercing are located in the spot where the eyelets would be if one was wearing a corset. It is a symmetrical piercing with an equal number of holes on each side. As few as four holes can be used (two on each side) up to as many as the expanse of skin will allow. 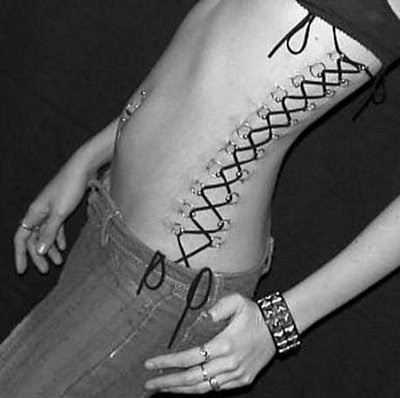 A common variation of the standard back corset piercing is front or side "corset-like" body mods. These piercings have also been seen lacing up the sides of legs, thighs, arms, wrists and even a throat!